Mining first started at Koffiefontein over 140 years ago and the mine’s remarkable longevity is a testament to its quality. Koffiefontein is a low grade deposit, but this is countered by the very high value of its diamond production. 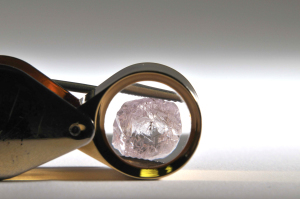 The mine produces white stones of exceptional quality, a regular proportion of which are of between 5 and 30 carats, and occasional fancy pink diamonds. In 1994, a 232 carat diamond was recovered at Koffiefontein, being the largest rough diamond ever produced by the mine. Petra’s expansion plan at Koffiefontein led to an increase in ROM production in FY 2018 to 52,537 carats from 51,173 carats in FY 2017 (underground only). The commissioning of the new ground handling system during Q3 FY 2018 enabled the subsequent ramp up of tonnages in the fourth quarter and allowed the mine to reach its guidance of ca. 0.65-0.7 Mt for FY 2018. The SLC is expected to maintain throughput rates in FY 2019 to deliver ROM throughput of ca. 1.0 Mtpa at an average grade of 7.5-8.0 cpht. The Company’s current mine plan has a life to 2031. 1. Refer to Petra’s ‘Effective Interest in Mines’ in the following document: Analyst Guidance Explanatory Notes. 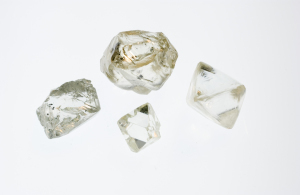 Diamonds were first discovered on the Koffiefontein farm in 1870. Mining started in the form of small claims that were later amalgamated into Koffiefontein Mine Limited. De Beers acquired control of Koffiefontein Mine Limited in 1911. Mining operations were then continuous until the advent of the Great Depression in 1932 when work was suspended. Between 1950 and 1953, a prospecting shaft was sunk which was followed by limited production. The mine was reopened in 1970 and preparations for increased production were completed in August 1971. Immediately after completing the preparations, production from the open pit commenced and proceeded to a depth of 270 metres. 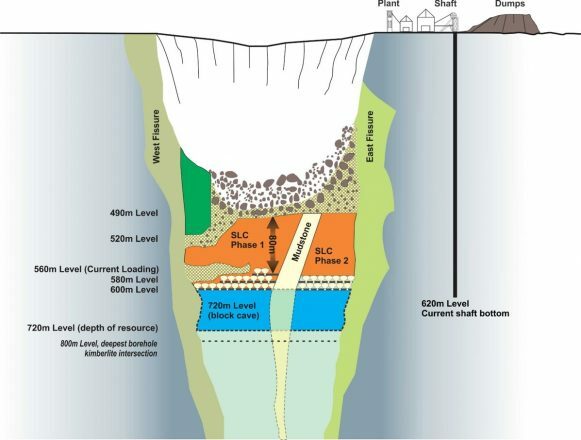 Underground development started in 1974 through a sampling programme. Underground production briefly took place in 1982 but ceased soon thereafter due to the 1981 slump in the diamond market, before resuming again in March 1987. In February 2006, De Beers ceased mining when the old order mining right for Koffiefontein expired and in July of that year Petra commenced operating the mine under care and maintenance conditions, before completing the acquisition of the mine in July 2007. From its first beginnings, Koffiefontein has been noted for the excellent quality of its diamonds, with Edwin Streeter commenting in 1898 that its diamonds were of the “first water” (meaning of exceptional clarity). 1. Resource bottom cut-off (Koffiefontein underground and Ebenhaezer): 1.15mm. 2. Resource bottom cut-off (Eskom tailings): 1.0mm. 3. Reserve bottom cut-off: 1.15mm. 4. Koffiefontein 56L – 60L SLC Reserves are based on Min 2-4D schedules. 5. US$/ct values of 525-550 for ROM, based on FY 2018 sales values and production size frequency distributions. ROM production increased 3% to 52,537 carats in FY 2018 (FY 2017: 51,173 carats) further to the commissioning of the new ground handling system during Q3, which enabled the subsequent ramp up of tonnages in Q4 and allowed the mine to reach its revised guidance of ca. 0.65 – 0.7 Mt for FY 2018. During May and June 2018, ca. 187,000 tonnes were hoisted, in line with the mine’s FY 2019 annualised targeted throughput of 1.0 Mtpa. The SLC is expected to maintain the throughput rates achieved in May and June 2018 and deliver ROM throughput of ca.1.0 Mtpa at an average grade of 7.5 – 8.0 cpht for FY 2019. Petra’s current mine plan has a life to 2031, but the residual resources at the mine indicate that the actual LOM could be in excess of 20 years. Koffiefontein’s expansion programme entails the development of an SLC from 560mL to 600mL, before putting in place a new block cave at approximately 720mL. However, the Company’s ongoing review of its future capital requirements may result in a continuation of the SLC to deeper levels, in preference to the installation of the block cave currently included in the Company’s mine plan. The SLC is expected to maintain the throughput rates achieved in May and June 2018 and deliver ROM throughput of ca. 1.0 Mtpa at an average grade of 7.5 – 8.0 cpht for FY 2019. Click on schematic to enlarge. Blue Diamond Mines (‘‘BDM’’) holds a valid and unencumbered new order mining right dated 2 February 2007 (the ‘‘Koffiefontein Mining Right’’), granted to it pursuant to section 23 of the MPRDA. The Koffiefontein Mining Right was duly notarially executed by the DMR and registered in the Mineral & Petroleum Titles Registration Office. A renewal of the Koffiefontein Mining Right was notarially executed by the DMR on 26 April 2017 and, pursuant to such renewal, the Koffiefontein Mining Right confers on BDM the exclusive right to mine for diamonds in relation to the areas it refers to until 23 February 2047. Section 2 of the Royalty Act requires BDM to pay the South African Government a royalty for minerals recovered under the Koffiefontein Mining Right. Pursuant to section 4 of the Royalty Act, the royalty is to be paid on gross sales in accordance with a defined formula set out in the Royalty Act. The formula applicable to rough diamonds is as follows: 0.5% + (earnings before interest and taxes as defined in Section 5 of the Royalty Act / (gross sales x 9) x 100) but not exceeding 7%. 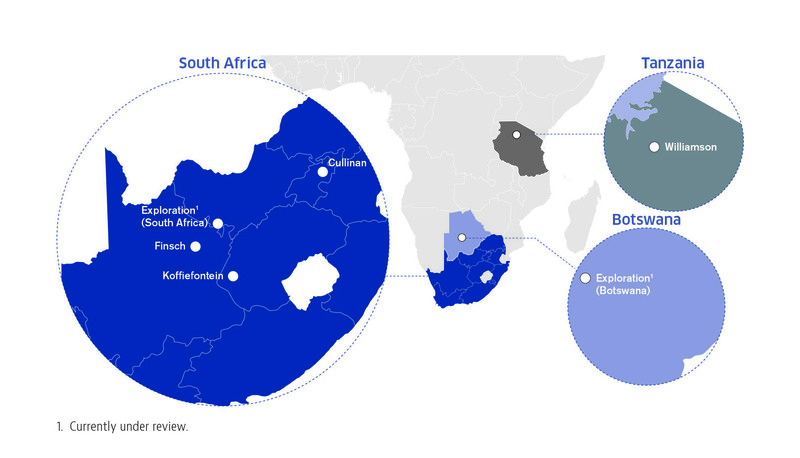 In addition, South Africa has a rough diamond export levy requirement of 5% as set out in section of the Diamond Export Levy Act 15 of 2007 (“Export Levy Act”). Producers are however exempt from this levy in respect of production that is exported provided that a certain percentage of their production is sold to local diamond beneficiation licence holders, on the basis more fully set out in sections 7, 8 and 9 of the Export Levy Act. BDM is also subject to corporate tax in South Africa at the rate of 28% in terms of section 5 and other provisions of the Income Tax Act 58 of 1962. There are no fiscal stabilisation provisions in place in relation to Koffiefontein Diamond Mine.